The Vietnamese Student Association’s president asked members if any of us would like to volunteer to create a website for the club. Excited to show off my new HTML skills, I quickly volunteered. 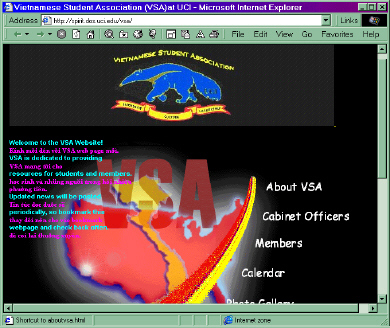 I wanted to make the first ever VSA website at the University of California at Irvine! The specs were quite simple – make a website to let viewers see the calendar of events, the name list of club officers, and the club’s mission statement. *update: The VSA-UCI website has seen many new students and changes since it’s original creation.